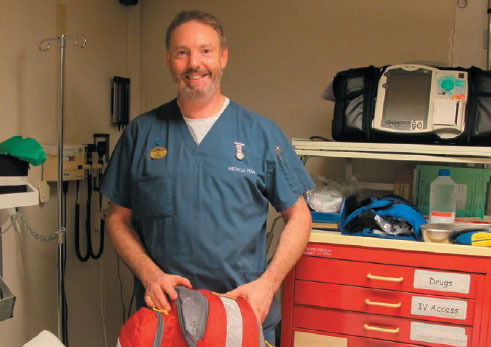 As a ship’s nurse, Leo Hamburger deals with everything from minor injuries to life-threatening conditions. What does the title ‘ship’s nurse’ conjure up? Someone handing out seasickness pills and dabbling in romantic liaisons? The reality – perhaps sadly – is very different. Ship’s nursing is a challenging, multifaceted role, and more a way of life than a job. Nursing on a cruise ship demands experience, common sense, versatility and skills in areas ranging from minor injuries to life-saving critical care. It also requires awareness of customer service. A ship’s nurse will typically work a four-month contract without a full day off. Health promotion for crew members. Depending on the ship, its size and itinerary, it will have up to four nurses, two doctors and sometimes even paramedics. Part of a small team caring for up to 5,000 passengers and crew, the nursing officers usually have their own cabin and a steward to look after them. The day usually starts with morning clinic in the medical department, where the nurse triages, treats and refers patients. Presenting conditions range from upset stomachs to accidents and heart or respiratory conditions, and even emotional issues, especially among the crew. There are sometimes more than 40 different nationalities on the staff, some find it difficult living in close quarters, often in shared cabins below the waterline. Clinic can last all morning and the work does not stop when the doors close. The nurse on call will usually hold the emergency pager and might have inpatients to care for, sometimes in a high dependency/intensive care ward. Modern ships are extensively equipped with monitors, ventilators, infusion pumps, pathology laboratories, X-rays and other facilities. Afternoon clinic usually lasts several hours and again is varied and busy. In the evening, nursing officers can take advantage of the ship’s entertainment, or if on night call might stay up with an inpatient or attend a call out. For a typical call out, the nurse attends the patient’s cabin to assess, transfer and admit them. All ship’s nurses are trained in advanced life support, and full resuscitation situations do occur. Arriving in port can mean a chance to get off the ship. The nurse might have to help transfer a sick patient to local medical facilities. The process often involves administrative and practical problems. Since living costs on board are minimal, pay can be another attractive element. For nurses on the lookout for a unique position with the chance to travel, ship’s nursing may be just the ticket.